On Monday's CBS This Morning, Major Garrett played up how President Obama has vacationed "less than his predecessor, President George W. Bush – 14 trips and 92 vacation days, compared to 50 trips and 323 for Mr. Bush." Garrett cited colleague Mark Knoller's presidential vacation figures, but overlooked Knoller's emphasis that whatever the amount of vacation time, "the burdens and responsibilities of the office" travel with the President. Garrett did point out that the Mr. Obama is "confronting some of the diciest poll numbers of his presidency." Anchor Norah O'Donnell also stated that "the President's approval rating is taking a nosedive." Knoller, a veteran White House correspondent, is well known for his tally of presidential vacations. On July 26, 2013, Knoller outlined on Twitter that President Obama made his 31st visit to Camp David that day, spending a total of 75 days at the executive retreat center in Maryland. He continued that "at same point, in presidency, GWBush had made 93 visits (294 days.)". The incumbent Democrat also spent part of the first weekend of August 2013 at Camp David. Back in August 2011, during Obama's last visit to Martha's Vineyard, Knoller noted the critiques of President Bush's larger amount of vacation days, and asserted that they were "unfair", explaining that "presidential 'vacations' have more to do with a change of venue than a getaway from the duties of office. Presidents can do things on 'vacation' they can't do at the White House, but they remain on-duty 24/7." NORAH O'DONNELL: And President Obama is taking a break from Washington this week. He's spending time with his family on Martha's Vineyard. But the vacation comes as the President's approval rating is taking a nosedive. Major Garrett is traveling with the President. 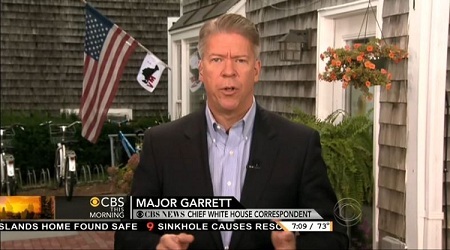 MAJOR GARRETT: Well, good morning. Every president needs to get away, and President Obama has done so less than his predecessor, President George W. Bush – 14 trips and 92 vacation days, compared to 50 trips and 323 for Mr. Bush. One common thread: Mr. Obama's beginning to experience some second-term blues. GARRETT (voice-over): The President stepped onto the island paradise confronting some of the diciest poll numbers of his presidency. It's only one poll, but Gallup constantly tracks presidential approval. Mr. Obama's is at 42 percent, with 50 percent of the country disapproving. His approval rating was 41 percent last week, a low not seen since December of 2011. When the President's approval rating dips this low, it's usually due to defections among Democrats. Revelations of counter-terrorism surveillance programs more aggressive than during the Bush years have unsettled the President's political base. PRESIDENT BARACK OBAMA (from press conference): I want to make clear, once again, that America is not interested in spying on ordinary people. GARRETT: As the President tries to defend the phone and Internet tracking, Republicans accuse him of ducking the issue for weeks. REP. MICHAEL MCCAUL, (R), TEXAS (from interview on NBC's "Meet the Press"): When the story initially broke, the President went undercover. He just finally came out last Friday trying to come up with ways to salvage the program by window-dressing. REP. PETER KING, (R), NEW YORK (from interview on CBS's "Face the Nation"): I applaud the President for continuing the NSA program. What I'm very critical of him for, though, is basically, he's been silent for the last two months. GARRETT: The cancellation of planned summit with Russian President Vladimir Putin highlighted new troubles with the President's attempt to – quote, reset relations with Russia – prompting more GOP criticism that Mr. Obama underestimates Putin. SEN. JOHN MCCAIN, (R), ARIZONA (from interview on Fox's "Fox News Sunday"): He's an old KGB colonel that has no illusions about our relationship; does not care about a relationship with the united states; continues to oppress his people; continues to oppress the media; and continues to act in an autocratic and unhelpful fashion. GARRETT (on-camera): On domestic issues, the President faces budget fights with Republicans in September; a fight over implementation of ObamaCare in October; and immigration reform faces an uncertain future. The common thread here, of course, is Republican skepticism or downright opposition. The President is unlikely to find much new momentum here, but one potential point of relaxation: he's unlikely to bump into any Republicans here on Martha's Vineyard. They're mostly over on Nantucket. Norah and Charlie, back to you.